Diagram extracted from submission opposing SAPEX's Arckaringa proposals by Dr Damien Bachmann. ALTHOUGH THE SOUTH AUSTRALIAN STATE PARLIAMENT has passed a law which bans fracking in an area of the south-east of the state, the Department of Mines and Energy remains adamant that fracking, if conducted at depth and under stringent conditions, poses little or no risk. 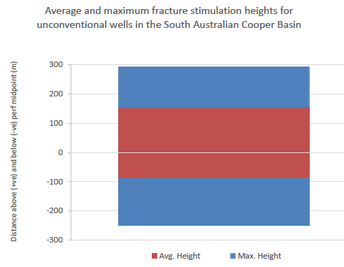 Many of the fracked wells are in the Cooper Basin but typically these are around 3,500m down, about three times deeper than the proposed Arckaringa fracking. 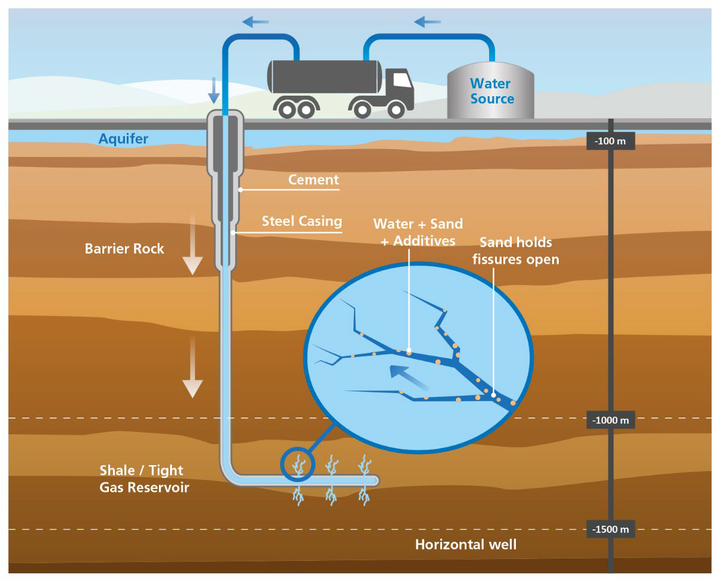 �The pressure of the fracking fluid required for in the Arckaringa, however, will be a lot lower. SAPEX’s EIR notes; "Exploration in the Cooper Basin targeting unconventional reservoirs were large in volume and pressure (up to 14,000 psi). 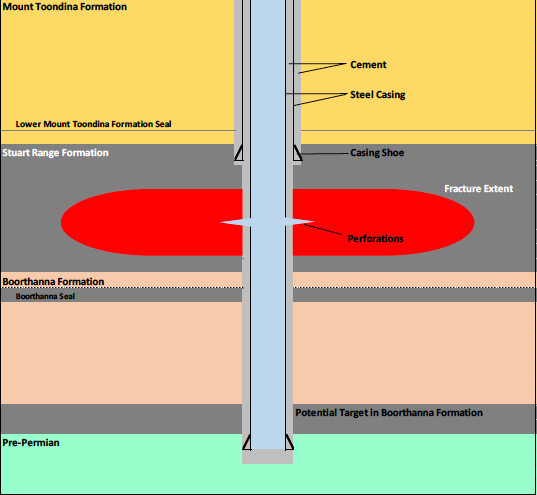 Injection pressure for a shale at 1,000m is expected to be between 3,500 – 4,000 psi." The exact location of SAPEX wells has not yet been fixed, but the company says it intends to target the bottom of the Stuart Range Formation where it up to some �250 metres thick. Dr Bachmann also notes that the federal government’s �2017 �Bio-Regional Assessment�of the Arckaringa says there is so much uncertainty about the composition of the Lower�Toondina.Formation�that�“little can be implied �regarding the hydrogeological characteristics”. In its assessment, the Department of Mines and Energy responded that SAPEX’s pumping pressure will be "such that the induced fracture network height is not expected to extend beyond 200m”. It also noted that before any fracking takes place, SAPEX will have to seek Stage 3 approval, using detailed site-specific geomechanical data obtained from the initial drilling of the well. Subject to Stage 3 assessment, the official watchdogs "deem there not to be any credible risk of fractures�propagating into shallow aquifers and causing contamination or pressure depletion,�in particular within the Great Artesian Basin". �Indicative fracture stimulation depths,extraced from the SAPEX Environmental Impact Report. 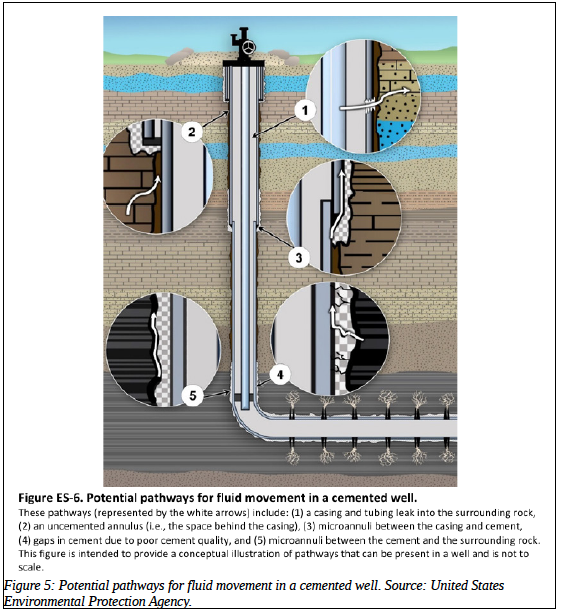 SAPEX concedes: "There is evidence of connectivity via enhanced inter-aquifer leakage between the Great Artesian Basin and deeper target formations where the Stuart Range shale is thin or not present, (e.g. the Billa Kalina Sub-Basin). However, this occurs outside of the Boorthanna Trough and thus is not the target area for fracture stimulation."